By Anthony Crupi . Published on March 26, 2019. 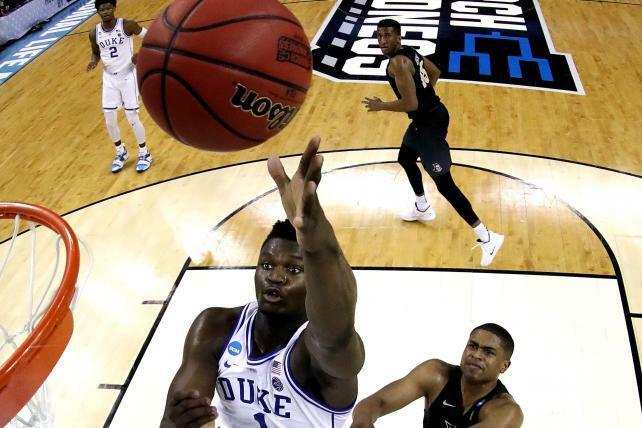 Duke's Zion Williamson lays in a bucket against the UCF Knights in the second-round game of the 2019 NCAA Men's Basketball Tournament. March Madness thus far has been the very picture of sanity, a relatively sedate affair bereft of buzzer beaters and bracket-busting upsets. But as much as everyone loves a Cinderella story, the preponderance of favorites that have advanced to the Sweet Sixteen only seem to have bolstered the tourney's TV ratings. According to Nielsen data, this year's NCAA Div. I Men's Basketball Tournament is on pace to be one of the highest-rated college hoops showcases in decades. Through the first four days of play, the deliveries in the metered markets are up 8 percent vs. the same time a year ago, and the average 6.4 household rating marks the second-largest turnout for the tourney's opening weekend since 1991. Much of the early success may be attributed to the fascination surrounding Duke's Zion Williamson. A prohibitive favorite to be selected first in the 2019 NBA draft, the freshman phenom has lit up scoreboards and Nielsen boxes alike over the course of his one-and-done collegiate campaign. In a rare nail-biter, Williamson and the top-seeded Blue Devils on Sunday staved off a near-upset by UCF in order to move on to a Friday showdown with No. 4 Virginia Tech. Featured in CBS's marquee Sunday afternoon window, Duke's 77-76 victory averaged 12.9 million viewers and a 7.8 household rating, improving on the year-ago Texas A&M-North Carolina broadcast by a whopping 37 percent. To put the Duke-UCF ratings in perspective, the second-round game trailed last year's National Championship Game telecast on TBS by a mere 403,000 viewers. Duke's win served up the highest ratings for a second-round game in 29 years; in fact, the only broadcast to put up bigger numbers in that Sunday 5:00 p.m. EDT window was the North Carolina-Kentucky thriller in 2017, which drew 15.5 million viewers and an 8.9 rating. But it's not a fair comparison—the Tar Heels-Wildcats classic was an Elite Eight game, not an early table-setter. Like the Dallas Cowboys and New York Yankees, Duke is a team with a huge national following that also invites a great deal of hate-watching. That dynamic was apparent earlier in the tournament, when the Blue Devils' opening game against North Dakota State drew 6.22 million viewers and a 3.8 rating in CBS's Friday 7 p.m. slot. That set another high-water mark, ranking as the most-watched first-round game since CBS and Turner first began co-hosting the tourney back in 2011. Duke wasn't the only team to draw a crowd over the weekend, however, as CBS also put up solid numbers with Wofford-Kentucky (8.96 million viewers, 5.6 household rating), Washington-North Carolina (8.92 million viewers, 5.6 rating) and Florida-Michigan (8.88 million viewers, 5.4 rating). All told, CBS's seven weekend games averaged 8.28 million viewers and a 5.1 rating, up 17 percent vs. the year-ago 7.08 million/4.4. Through the first 52 games of March Madness, CBS and Turner are averaging 2.99 million viewers and a 1.9 rating. TBS's slate of 12 games averaged 2.31 million viewers, making it Turner's top performer, while TNT is humming along at 1.95 million viewers and truTV is bringing up the rear with 1.22 million. TBS's coverage of Auburn's 89-75 defeat of a disappointing Kansas Jayhawks squad marks the tourney's most-watched cable telecast thus far, delivering 4.62 million viewers and a 2.7 rating. TNT put up its biggest numbers with Sunday night's anticlimactic Ohio State-Houston game (3.57 million, 2.1), while truTV's best effort came courtesy of a Baylor-Syracuse bombing run that saw the two teams combine for 19 successful three-point shots. In knocking out the Orange, the Bears helped truTV serve up 2.01 million viewers and a 1.2 rating. While there's still plenty of basketball left to be played before CBS airs the April 8 title tilt, there's no getting around the fact that this year's tourney has been all but devoid of drama. Not only have the four No. 1 seeds (Duke, North Carolina, Virginia, Gonzaga) advanced to the Sweet Sixteen, but so have each and every No. 2 and No. 3 seed. The favorites won every single game in the round of 32, which leaves fans of the dark horse bereft of a rooting interest. Besides No. 5 Auburn, which takes on the Heels on Friday, the closest thing we have to a long shot is the No. 12 seed, Oregon. Of course, any comparison to last year's insanity is doomed to failure. In 2018, not only did a No. 16 seed vanquish a No. 1 seed for the first time ever, but the scrappy Loyola crew and their 98-year-old mascot Sister Jean made it all the way to the Final Four before bowing to Michigan. Even by March Madness standards, the year-ago tourney was bonkers. The lack of last-second dramatics aside, advertisers have to be quite pleased with the ratings results. While AT&T, Capital One and Coca-Cola cast a long shadow during the tournament, thanks in large part to their official NCAA Corporate Champions status, other affiliated brands invest a good deal of marketing cash to stand out from the pack. According to iSpot.tv estimates, NCAA partners Geico, Infiniti, Buick, Lowe's, Buffalo Wild Wings and Wendy's are among the biggest spenders in the spring hoops showcase, which as in years past has generated the bulk of its ad revenue from automotive, insurance, quick-service restaurants, wireless providers and beer brands. March Madness is now the second most lucrative postseason sports environment for broadcasters, trailing only the NFL playoffs and Super Bowl for the amount of advertising dollars it generates. According to Kantar Media data, last year's tourney churned up $1.32 billion in ad spend, up a modest 3 percent versus 2017's $1.28 billion, while marking a 17 percent improvement compared to $1.13 billion in 2014. That's significantly more commercial cash than what TNT and ABC/ESPN reap during the NBA postseason ($970 million) and all but eclipses the $468 million placed on Major League Baseball's playoffs and World Series. Looking ahead, it's not inconceivable that Duke and UNC could meet in the Final, and while that would be quite a hoot for the state of North Carolina, for the rest of us the prospect of such a pairing is tantamount to rooting for smallpox over polio in a battle of vanquished medical scourges. Of course, CBS would be thrilled to host such a meeting; not only is CBS Sports Chairman Sean McManus a Duke alum, but the historical element would make for colossal ratings. Despite having squared off against one another 251 times over the past 99 years, the ACC rivals have never once crossed paths in the NCAA tournament. Should UNC and Duke meet up in Minneapolis next month, Nike marketers should brace themselves for some unwelcome free media exposure. When Zion Williamson blew out his left shoe just 36 seconds into the Feb. 20 Heels-Blue Devils game, social media replayed the footage of the footwear explosion as if it were basketball's answer to the Zapruder film. Since recovering from his sneaker-related injury, Williamson has been sporting customized Nike Kyrie 4 kicks. Nike, which invested some $11.4 million on 94 in-game units in the 2018 tourney according to iSpot.tv estimates, has not bought airtime in this year's event. But the brand's iconic swoosh logo is featured on the uniforms of 12 of the remaining 16 teams.